Our first Natural Products initiative, the Copaiba Sustainable Harvest Project, is making great strides! Copaiba is a large Amazonian tree whose golden amber-colored resin is prized for its medicinal properties and use in cosmetics. 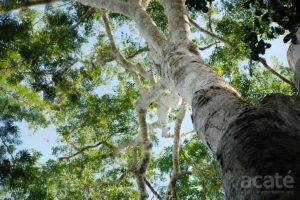 The valuable resin is not able to be sourced in most settled areas of Amazonia as copaiba trees are cut-down early in deforestation and their hardwood processed to make patio furniture. In the rainforest protected by the Matsés, copaiba trees abound! The project is simple, scalable, and replicable in other communities. 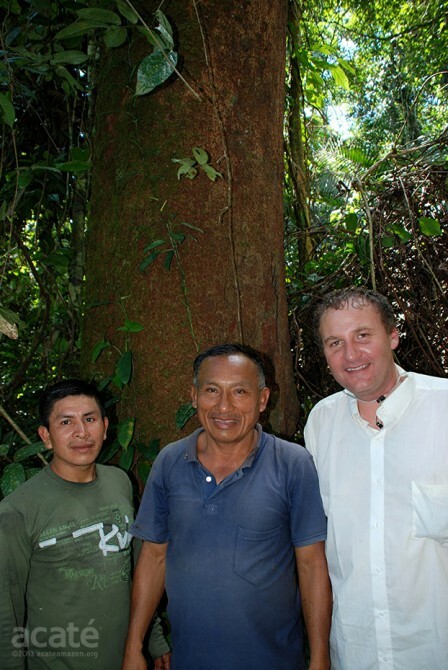 Acaté is partnering with Matsés communities to identify copaiba trees in their territory, sustainably tap and harvest the tree’s resins, bottle, and bring the product to Iquitos for refinement and market. Through the careful and considerate harvesting of the resin, the Matsés can realize a sustainable income stream that lessens their dependency on external aid or the lure of the petroleum or gold industries. It provides alternatives to bush-meat hunting and timber extraction and brings real revenue to their communities. Ours is a scaleable model for market-based conservation that maintains economic self-sufficiency! The Matsés villages of the Chobayacu we’ve partnered with have successfully extracted 50-liters of the tree’s resin during the dry season using sustainable harvesting methods. Now that the rains have returned permitting transport by boat, our next task is to bring the bottles of resin to Iquitos for marketing and sale. We’ve internally raised about 1500 dollars in individual donations to help fund the project’s start-up costs, but we’re still $2,000 short of the minimum budget needed to bring the copaiba to market. This program will be self-sustaining but, as with all initiatives, has start-up costs to get off the ground! We need your support today! At Acaté, we know that real conservation is not about telling peoples what they shouldn’t do but rather in developing tangible alternatives where few or none exist. Whether it be creating economic opportunities for local communities via our copaiba resin project, through revitalization of eroded deforested areas or through earth-balanced permaculture approaches, Acaté is striving to make a difference. Please consider a recurring donation or a one-time donation to help the Matsés and Acaté see this program succeed! Keep me updated on what's happening!